Ficus have several characteristics which have helped them to survive over the centuries. For one, they are “epiphytic.” This means they have the ability to begin life on another tree. Seed deposited by the wind or a bird on the bark of another tree will begin to grow. In time the fig will send down roots to the soil and foliage upwards into the canopy of its “host”. Once the figs roots reach the ground it is only a matter of time before the plant will overtake and eventually “strangle” its host. Hence the term strangler figs, which describes this unusual characteristic typical of many figs. This process is helped along by another aspect of fig cultivation … the plants willingness to produce aerial roots under the right conditions. In locations where high humidity is present, figs Willow Leaf Fig (Ficus salicifolia/nerifolia) use, during the regular growing season, the plant should be fed every other week without fail and may be foliar fed in-between times. Most people who kill ficus, do so with kindness. Ficus will prefer even moisture levels. We reason (incorrectly) that because they are tropicals they must like a lot of water. Actually they are almost a semiarid plant and will prefer to be slightly on the dry side. Continually dumping water onto an already sopping wet plant will result in yellowing leaves, massive leaf drop and eventually the demise of the tree. We have discovered over the years that ficus and in particular, Willow leaf ficus can withstand massive amounts of root pruning if done at the right time. That time appears to be in the beginning of summer as the weather in North Carolina heats up and the fig begins to experience rapid growth. If less root is taken the trees may be planted at any time of the year. Root sections and trimmed branches from styling sessions can be saved and will root easily. We plant our trees into a pH neutral standard bonsai potting mixture which provides for good aeration and drainage. The trees should last an average of two or three years before needing to be repotted. Willow Leaf Ficus can be found in reference books under a surprising number of headings, not the least of which include: F. salicifolia; F. nerifolia, F.regularis, F. irregularis, F. celebensis and F. mexicana. Willow leaf ficus will leaf drop totally under stressful conditions. These might include soil that is too wet or too dry, temperatures that are too hot or cold or shifting dramatically, drafts, and dramatic changes in light intensity. New leaves generally will grow back in about two to four weeks if the plant is healthy. Longer regeneration times indicate an unhealthy plant. In colder climates there is a natural amount of limited leaf drop which will occur in the fall. When warmer weather returns, the fig will generate a new flush of growth. Salicifolia forms aerial roots easily thus making it a prime choice for Banyan style designs. Trees may be defoliated more than once in a season if needed, resulting in smaller leaves and plentiful backbudding. Likewise, surface roots tend to fuse and enlarge quickly making for some spectacular trunk bases and nebari. Aerial roots will drop from branches, take root and thicken to become secondary trunks which in turn support those branches allowing the tree to spread dramatically Such trees are often referred to at Banyans and in certain parts of the world they can cover an acre of more of ground by growing in this manner. Although some ficus will exhibit this unusual growth pattern it is not specifically limited to the ficus species. Instead it is a “style” which may be exhibited by a number of species including: Schefflera, Pandanus, Mangrove, and Clusia. 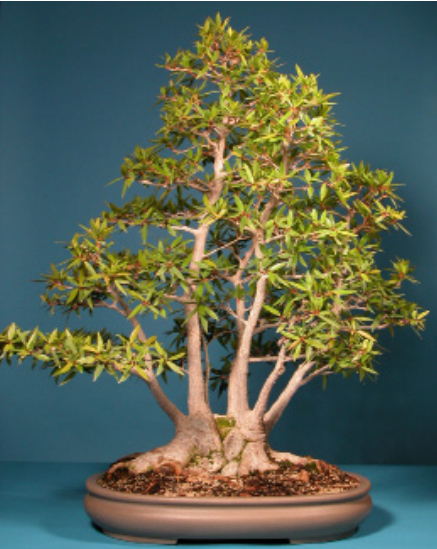 Since aerial roots can be developed relatively easy in bonsai cultivation, “Banyan” style bonsai are very popular in Florida and other warmer regions. One final aspect of ficus cultivation which should be noted is the plants copious production of latex. This white sticky sap issues from any cut or break made on the tree. The latex is carried in a completely separate vascular system from the normal sap that the tree uses to transmit water and sugars. Why figs produce this latex is not completely known, but in the past, the latex of some figs were collected and refined into rubber. The sap can irritate skin and eyes on some people and if allowed to build up and dry, can leave a sticky mess on bonsai tools and work tables. Trees can sometimes extrude large quantities from a cut. This behavior will not cause branch dieback or endanger the tree. Universally, ficus will appreciate as much full, strong sunshine as you can provide. Ficus grown at the Bonsai Learning Center are placed in locations where they will receive the maximum amount of sunshine during the day. Trees which are kept indoors should be placed in sunny windows or grown under artificial lighting for at least 16 hours per day. Even so, you may expect a certain amount of leaf drop when you bring the tree in from outdoors. Note that it is not mandatory to grow figs outdoors in the warm months. As long as you provide optimal growing conditions, they will also thrive indoors. Our preference, however, is to grow them outdoors when possible because it simply makes them easier to care for. Temperature is an important factor for growing figs. Generally most ficus will enjoy indoor temperatures between 60 and 95 degrees Fahrenheit. Higher or lower temperatures will result in slowed growth or death. They prefer even temperatures which do not vary greatly from day to evening and from summer to winter. If you are growing ficus outdoors, they should be brought inside once nighttime temperatures get near 55 degrees Fahrenheit. Ficus like to dine well. They are heavy feeders, although certainly not gourmands. Standard chemical fertilizer mixtures which provide nitrogen, phosphorus and potash as well as some trace elements are fine. Organics are OK as well although you may want to avoid them for indoor cultivation because they will encourage insect infestation.